Women starting their first research labs tend to be paid lower salaries, have fewer staff and have access to less laboratory space than their male peers do, according to an analysis of UK scientists. 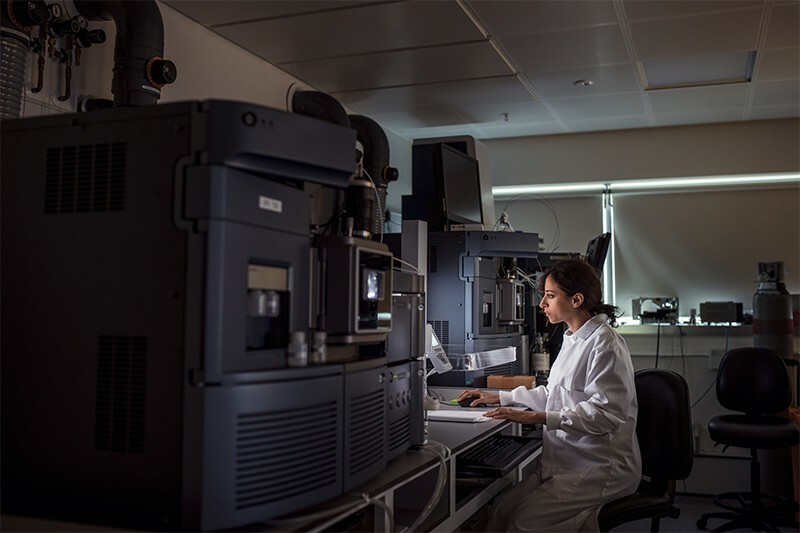 A survey of 365 early-career principal investigators (PIs) who started labs in Britain between 2012 and 2018 found that many lacked the support they need to push their careers to the next stage. But women faced more obstacles than did male researchers in the same position, which put them at a disadvantage, say the authors of the work, published1 on the preprint server BioRxiv on 10 March. 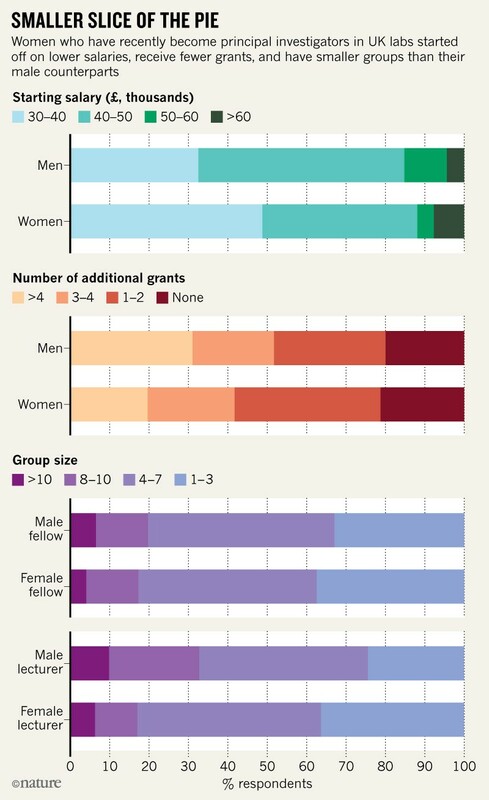 Male investigators gain funding momentum more easily, allowing them to build critical mass by expanding the numbers in their labs, say Sophie Acton, a cancer immunologist at University College London, and her colleagues in the paper. The surveyed PIs typically had received a career-development research fellowship that offers three to five years of funding, or had secured a university lecturer position that enables them to apply for research grants. More than 80% worked in the life sciences. The survey found that during the first few years of running a lab, not everyone had access to the same facilities, mentorship and people power needed to make their research groups successful. Many also lacked optimism about the future, and were dissatisfied with their institutions. Women generally had access to less lab space and supervised fewer PhD students and postdocs than did men, particularly if they were also a lecturer (see ‘﻿Smaller slice of the pie’﻿). They also tended to win fewer grants after starting their labs. These factors left them “more likely to stall” than men, say the authors. After five years, women overall had received less funding and had fewer lab staff. The study also found that women’s annual salaries were between £3,000 (US$4,000) and £5,000 lower than those of men at the same level, in many cases because they started at a lower pay grade. Acton says gaining momentum in winning funding is important because once the initial grants have run out, junior lab heads compete against each other for the next round of funding. “If your lab has had two people working for five years, you cannot compete with someone who has had eight to ten people and published three papers over the same time,” she says. “Only the top few percent will make it all the way through,” she adds. Around one-quarter of researchers surveyed felt they had received no mentorship, and women without mentors reported the lowest levels of optimism about their future careers. About 20% of respondents said they were dissatisfied with their environment, including factors such as their department, host institution, space and facilities. The authors recommend a number of measures to help even the playing field. Departments should appoint mentors for all junior PIs, for example, and institutions and funders could implement a policy that means researchers who have similar, major research grants start out on the same pay grade. Funders could also offer PhD studentships as part of fellowships and other awards for new PIs, instead of funding students through university training programmes which tend to benefit more established groups. And if institutions do not honour promises of facilities and lab space, funders could withhold funds. “New PIs need time and support to invest in their own development as well as that of their research staff and students,” says Katie Wheat, head of higher-education engagement at Vitae, a company in Cambridge, UK, that helps with research-career development. Some funding agencies have taken note of the findings, and have invited the authors to discuss their work. These include biomedical-research charities the Wellcome Trust and Cancer Research UK, both in London, and the UK government agency responsible for science. Acton, S. E., Bell, A., Toseland, C. P. & Twelvetrees, A. Preprint at BioRxiv https://doi.org/10.1101/571935 (2019).